We’d love your help. Let us know what’s wrong with this preview of The Man Who Caught the Storm by Brantley Hargrove. “Masterful. This is what man versus nature is all about.” —Skip Hollands The life and death saga of one of history’s greatest storm chasers: a tour-de-force tale of obsession, ingenuity, and the race to understand nature’s fiercest phenomenon—the tornado. To ask other readers questions about The Man Who Caught the Storm, please sign up. Where would we be without the men and women who went ahead no matter the risks, and moved forward to understand our world better and the forces that swirl within it? Tim Samaras was not your typical scientist/engineer. He received no formal education in his field, no college or advanced degrees and yet this man through his brilliance and obsession with tornadoes made strides that advanced the study of these violent storms that even today one marvels at. How to understand these storms? There was a dearth of information about these storms and Tim's fascination with them made him a foremost authority in the emerging field of how these storms operate. It was well known that these storms brought destruction, loss of property, and to some death. Tim and his fellow storm chasers went after these storms patrolling the areas like Tornado Alley in search of the whys and wherefores. He invented and conceptualized equipment that would eventually be able to withstand being inside this storm and was able through his efforts to forward the knowledge of this, one of the last few mysteries of the modern world. Tim chased the storms and had what some might consider to be an obsession. He followed these storms eventually losing his life as well as the life of his son and friend in one of these horrendous acts of nature. To Tim and others like him, we owe debts of both gratitude and thanks for the knowledge he provided. Today thanks to Tim, scientists know so much more and perhaps someday the mysteries of a tornado will be mysteries no longer. Thanks to Brantley Hargrove, the Publisher, and Edelweiss for providing this reader with an advanced copy of this book. Highly, highly recommended. In this debut work, Brantley Hargrove captures the adrenaline-fueled chase of tornadoes, season after season, by a man whose persistence, inventive genius, and bravery led to never-before-made measurements from inside tornadoes. Caught by the quest to explain and predict these volatile, destructive monsters, Tim Samaras spent his life getting as close as he could to tornadoes from Colorado to South Dakota, Kansas, Oklahoma, Texas, and even as far east as Alabama. For a Highly, highly recommended. In this debut work, Brantley Hargrove captures the adrenaline-fueled chase of tornadoes, season after season, by a man whose persistence, inventive genius, and bravery led to never-before-made measurements from inside tornadoes. Caught by the quest to explain and predict these volatile, destructive monsters, Tim Samaras spent his life getting as close as he could to tornadoes from Colorado to South Dakota, Kansas, Oklahoma, Texas, and even as far east as Alabama. For anyone who's ever heard a tornado siren or traveled through Oklahoma in spring, these locations will be very familiar. Hargrove also gets just right the off-the-beaten-path Great Plains locations in which tornadoes develop and where chasers go to find them. The author has done an excellent job of conveying excitement, explaining Samaras' passion, and making the science accessible. This was a wonderful book to give you insight into the man who chased and studied tornadoes. I, like many others, first got to know Mr. Samaras through the Discovery Channel's Storm Chaser show. This book let me know more about him, both in his personal life and his professional. For instance, I had no idea he never spent a day in college. He was so brilliant that it is hard to imagine that he didn't have a degree to his name. To many a tornado is a thing to be feared, as it well should be! But f This was a wonderful book to give you insight into the man who chased and studied tornadoes. I, like many others, first got to know Mr. Samaras through the Discovery Channel's Storm Chaser show. This book let me know more about him, both in his personal life and his professional. For instance, I had no idea he never spent a day in college. He was so brilliant that it is hard to imagine that he didn't have a degree to his name. To many a tornado is a thing to be feared, as it well should be! But for others, it is one of the Earth's last mysteries waiting to be discovered. Hopefully the research and ideas that Mr. Samaras left us will further unlock the mystery in future generations. Tim Samaras . . . What an incredibly fascinating, brilliantly intuitive, intelligent man!! Hargrove's biography honoring him: As enjoyable to read as it is enlightening. Several years ago - I have no way of remembering now exactly when - I saw an article out of National Geographic in my RSS newsfeed. It was about the death of Tim Samaras. At the time, I knew the name, that he was a renowned storm chaser, and now I knew he was dead. He had been killed by the very thing he spent his life chasing. I remember wanting to cry. I didn't know Samaras; I wasn't a chaser; I had little real interest beyond curiosity. But I knew that Samaras was a great man, that he was a great chaser, that he had taught us more than anyone about tornadoes. And I knew in that moment that the loss of Samaras was a deep blow to science and the entire study of tornadoes. Small wonder then that when I saw The Man Who Caught the Storm on Netgalley that I jumped at the chance to read it. To say that it has been an honor and a privilege to read this biography may seem hyperbole, but it isn't. From the moment I started reading, I felt connected to Samaras. His early years as a "tinkerer" made me think of my father. His curious but engineer-y mind made me think of all the people I work with. His focus, his passion, his drive, his desire to unravel the mystery and save lives all demanded I take notice. The first third of this book is about the early years: growing up, meeting his wife, working for the government, and being insatiably curious about the storms. Hargrove sets the tone immediately. The excitement and eagerness is in the tone, the word choice, the cadence. It's impossible not to be drawn in, to feel . As the chase rachets up and the danger becomes more palpable, Samaras works to be better. The second third of the book is the "middle years" but it is also about the ties he forges with other chasers, others studying the tornadoes and storms. It's a beautifully crafted discussion of the rise of Samaras to fame. This portion could have become bogged down and dragged. But, it didn't. Instead, the emotion of the relationship - even when those relationships are not good - keeps this middle portion interesting and exciting. It also teaches extensively about storms and tornadoes. It was fascinating! Hargrove taught effortlessly. When describing the processes behind tornado birth, he uses the same emotional language he uses to recount chases or to describe relationships. It's interesting to read and completely accessible to non-science people. The final third of the book is the last chase. The dramatic irony of this book is that we all know how it ends. Samaras, his son Paul, and fellow chaser Carl are going to die, taken by the very storm they are chasing. For me, this only heightened the tension of the entire book. It's coming - that final chase, that final storm - and when it does it will be a storm to end storms. It's that Sword of Damocles hanging over everything else - the wide-eyed young Samaras, the seasoned veteran, the dedicated chaser - and this knowledge infuses everything with an intense poignancy which is only underscored by Hargrove's excellent and compelling word choices. In the end, it takes a monster to take out a legend, and that tornado was a monster. The level of detail about the timing, the locations, the speed and shape of the tornado are incredible, built up from information from many sources - everything from someone just a few hundred yards ahead of them who survived to mobile Doppler and many other first hand accounts as well as the cameras running inside the car. This is a deeply emotional work and Hargrove took the time and effort to understand Samaras the man as well as Samaras the chaser. It shows. I feel like I know him. I feel like I understand his drive. Hargrove says Samaras' wife Kathy was invaluable in giving him a look into Samaras' heart. There were many people interviewed and how allowed correspondence to be used for this book. IT shows because I feel like I got a glimpse into the heart of the man, that Hargrove has forged a connection between a legend and a reader. I laughed and I cried. Hargrove thanks many people for helping him write this book. I feel like thanks are needed. First, to Hargrove for caring enough to write this, his first book. Second, to Kathy Samaras for letting us see into the heart of her husband. Third, all the people who helped Samaras in his quest to see into the heart of the tornado and all those who worked with him in some capacity. And lastly, but perhaps most importantly, I want to thank Tim Samaras for being curious, for caring enough to want to make a difference, for chasing his dreams and the storms. There's an old quote regarding courtship, "She chased him so hard, he caught her." Every time I see the title, I think of this quote and how truly appropriate it is to Samaras. I put this on my "to listen" list when I saw it was a book about a tornado chaser because I love anything to do with tornadoes. It's horror, but real life, and actually terrifying. I didn't realize Tim Samaras was the guy from Storm Chasers, which I tried watching and found boring. Which, as it turns out, was the point. Samaras was a real even-keeled sort of guy and he found the entire production to be worthwhile for the money, but all of the big dramatic stuff had nothing to do with what chasing I put this on my "to listen" list when I saw it was a book about a tornado chaser because I love anything to do with tornadoes. It's horror, but real life, and actually terrifying. I didn't realize Tim Samaras was the guy from Storm Chasers, which I tried watching and found boring. Which, as it turns out, was the point. Samaras was a real even-keeled sort of guy and he found the entire production to be worthwhile for the money, but all of the big dramatic stuff had nothing to do with what chasing his way was about. That was the TV stuff, and so, finding it boring was finding it realistic. A fascinating look at a man who didn't have a formal education but worked hard enough to play with those who did a lot of school. It's not a spoiler to say he died, but I hadn't considered it when I began listening -- I knew so little (nothing) about him. But Hargrove handles it really well, and I found the book to be really interesting start to finish. As the author mentions of the wonder, adrenaline, and a pull exerted towards hunting down the tornados, this truth work also pulled me through, as a newbie of tornados, through all the technicalities to the final days of the brave Storm chaser Tim Samaras. Captivating at times, informative right through of the determination and obsession Tim Samaras possessed and displayed to achieve his goals against a great giant and monster, within his own David and goliath narrative, up against a devastating As the author mentions of the wonder, adrenaline, and a pull exerted towards hunting down the tornados, this truth work also pulled me through, as a newbie of tornados, through all the technicalities to the final days of the brave Storm chaser Tim Samaras. Captivating at times, informative right through of the determination and obsession Tim Samaras possessed and displayed to achieve his goals against a great giant and monster, within his own David and goliath narrative, up against a devastating entity that rips asunder all in its path, living on the edge and right through, through the eye of the storm, taken by the hand of the author with meticulously researched work. Chewed my way through in less than 24 hours. A brilliantly written, accessible, informative, fast-paced narrative. A solid tribute to a man whose skills, curiosity, patience, and drive pushed the limits of science forward in a way that, one day, save more lives. I really enjoyed this book, but towards the end knowing they were going to die and how they died just made me really sad. What a great man lost. I feel like he is more of a silent hero and someone kids could look up to about following your passion and not giving up even when everyone seems to think you will fail. Throughout the book I wanted Tim's perspective and I know that is impossible, but I wonder what his thoughts were during his career about what and why he did what he did. Received from NetGalley. Full review to come. Let's just get this out of the way right now - this book is one of my few 5 Star reads of the year and it was fantastic. I could not put it down. I mean, I was forced to when I had to go to work and such, but the book was an awe-inspiring glimpse into the life of a man who KNEW tornadoes and that ultimately cost him his life. I've lived in the Midwest my whole life, Minnesota and Nebraska. I have been very lucky to have never actually crossed Received from NetGalley. Full review to come. I've lived in the Midwest my whole life, Minnesota and Nebraska. I have been very lucky to have never actually crossed paths with a tornado, but they are terrifying nonetheless, as well they should be. As much fun as it is to go out and chase, this book and the death of Tim Samaras shows that even for the professionals, that choice can have tragic consequences. Spectacular, Informative , Wildly Entertaining! Tornadoes are amazing creations of Mother Nature and while I respect them immensely I never quite understood the formation, the power, the beauty, and the exhaustive research and funding needed to keep the public safe from 'The Beast'. Last year I found myself face to face with an EF2 Tornado in my home state of NEPA. To say I was terrified having never been involved with this force of nature is an understatement. When I heard about this book I couldn Spectacular, Informative , Wildly Entertaining! When I heard about this book I couldn't wait to contact Brantley because I wanted to ask many questions that lingered in my mind about staying safe should I ever find myself in the outer core of a tornado again. That was everyone but myself as I left mine home. I peeked over the man's shoulder nearby and found out we were direct line of fire as we were the bulls eye. With over 120 mph winds, blinding heavy rains, quarter size hail and enormous faith in God I drove like a demon off the mountain to get my mother home safely. That normal 20 minute (if that) drive felt like hours and I truly believe 'Jesus took the wheel' because my fingers were clenched and driving like I stole my lil honda civic. Having recently purchased it a few years earlier and still with many payments ( you know the panic) I couldn't fathom sticking around and risking both our lives and the only asset I owned having been bankrupt and homeless. I couldn't see the road, the canopy tops of gas stations to me wasn't ideal place since they can topple over plus gas could ignite, nor staying huddled in the center of the movie theatre as it was all encased with large windows around the entire front and sides, and we weren't allowed to stay in the back of the individual showing areas, so I drove as fast as I could not knowing was it ahead or behind nor where it was without any compass , gps, or even cell phone. Needless to say when we drove up the mountain it was on it's way behind us and when we departed the mountain it was just beginning there but just leaving where we headed up Susquon Road Dupont Pa. I later learned the shear magnitude of the tornado upon us was 500 yards wide and nearly 13 miles long. I remember turning the corner and seeing just devastation everywhere with roofs turn off, cars toppled and or crushed, massive trees uprooted, insulation in peaks of tree tops, doors blown in on houses and roads nearly washed away. Yet there I was driving through it all before they quickly closed off the only way home in our rural area. Upon contacting Brantley he noted, " It’s one of those things where you’ll never forget where you were. I still remember that bright green sky during Jarrell ‘97." So true, so very , very true. 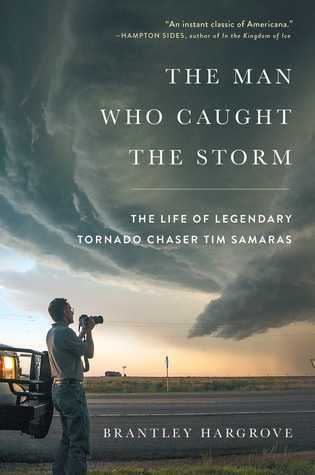 Upon recalling the events of that day after reading this wonderful novel about a legendary storm chaser 'Tim' and his family, friends, and colleagues I realized just how lucky I was and how unfortunate Tim and his situation was to everyone who knew him, but more importantly to the public. Without Tim's expertise as a storm chaser-engineer we would not be as knowledgeable as we are about the base of these monsters as he developed probes to deploy in tornadoes for scientific research. These men and women put their lives on the line often without care or concern for themselves; at great lengths against better judgement and families wishes, to research and develop new tools to help us all understand the inner workings of these weather phenomenons. For Samaras from Lakewood Colorado tornadoes were an obsession not addiction nor hobby. Many of us can probably recall the 'Twister' movie in which the Toto probe was used. A steel drum with sink basin bottom. "The tornado has proven a foe as worthy and wily as any fabled monster". The main area of interest at this point is at ground level to measure the blind spot (direct pressure and direct measurements). Twistex was born out of this idea that tornadoes feed on convergence , on collision and opposition. Yet, without funding these men and women are at a stand still because they must utilize whatever resources are available to them and in many cases they are simply lacking. What we must remember is you can't outrun Mother Nature nor can you outrun a Tornado. Converging air mass can switch and parent tornadoes can create new spawned tornadoes that are equally as powerful as the parent. When Brantley mentioned the route Tim took , the danger that was upon him, the death of a legend I was shocked because while I heard about it I wasn't fully engulfed in it as I never watched Storm Chasers nor was all that interested in Tornadoes since Tornado Alley is not near me and I won't ever leave my area due to finances. Yet when it happens to you, you change your attitude really quick. I'm now a doppler radar fanatic and have downloaded several weather alert apps (just in case). What I learned from this reading is that even doppler is not a sure bet as it lags with a 5 min wait time to update. A lot can happen in 5 minutes without knowing where a tornado is headed especially if out in the elements and or on the road. I learned so much more simply from reading this book that I'm eternally grateful and so appreciate of everyone involved. Raw emotions and grief is not easy but there are many lessons learned out of this terrible, terrible tragedy from a veteran who gave his life in the name of science. What I am immensely proud of is the fact that he was for all intense purposes an underdog. Tim had no grad degrees and was ostracized for it. How can a person without an ivy league or college degree nor a scientist or engineer in the field know anything more than they did. Yet Tim didn't get bitter he got better! Through his research we learned that the core was not untouchable. We may have more to learn but you can be assured it's because of Tim and other storm chasers and writers who publish their research and findings that we are that much closer to solving the mystery. Thank you Brantley, the publisher, NetGalley, and Aldiko. A brilliant piece of work, it's hard to believe that this is Brantley Hargrove's first book. Organized and researched flawlessly, Hargrove not only displays excellent research and writing skills, his grasp of the science is superb. Tim Samaras, it turns out, was much more than the image portrayed in National Geographic and on the Discovery Channel. He had a reputation for being a cautious chaser, but it's shown here that he long took the kind of risks that eventually killed him, his son Paul, and A brilliant piece of work, it's hard to believe that this is Brantley Hargrove's first book. Organized and researched flawlessly, Hargrove not only displays excellent research and writing skills, his grasp of the science is superb. Tim Samaras, it turns out, was much more than the image portrayed in National Geographic and on the Discovery Channel. He had a reputation for being a cautious chaser, but it's shown here that he long took the kind of risks that eventually killed him, his son Paul, and his chase partner Carl Young. Importantly, though, Samaras was not a thrill seeker. Although he lacked an academic degree, he was a scientist in every sense of the word, and a man who sought to understand and solve the puzzle of why tornadoes form, what makes one tornado an EF1 and another an EF5 monster, and what affects their lifespan. He went about this by creating the first successful tornado probe. Carefully analyzing why earlier probes like TOTO had failed, Samaras used his work experience to design a probe that would actually be pushed firmly down to the ground by tornado winds rather than lifted and blown over or away. The result was the triumphant deployment of HITPR - better known by its nickname, the "turtle," into the core of an EF4 tornado near Manchester, South Dakota. Samaras improved his probes and put together a scientific chase team, TWISTEX. In a sad indictment of our supposedly egalitarian society, Samaras' ability to raise grant money was affected by his lack of a college degree, and he had to resort to endorsing products and appearing on a Discovery Channel TV series to pay the bills. At the end of his life, Samaras was starting ground-breaking research on lightning, helping to design a new instrumented vehicle for the purpose. But in the middle of his work, a tornado outbreak drew his attention, and the result was catastrophe. Hargrove had the advantage of writing about a man whose life was well-documented, and whose wife, daughters, and illegitimate (but acknowledged and loved) son, as well as his research associates and friends, cooperated. This makes the story complete and accurate, and permits Hargrove to give a full portrait of Samaras and his research - and his tragic death in the El Reno tornado. More than a few interesting segments dealing with Tim's pod/probe creations. I learned a few things, found myself saying, "hmmm," a few times, but that's normal for me.🙃 There are obviously still unanswered questions re decisions made in the last minutes, but those may never be answered to anyone's satisfaction. Of course, the what-ifs remain (those last two north options). I'm left feeling profoundly sad for what Kathy is going through. As often as the multiple events pertaining t A solid debut. I'm left feeling profoundly sad for what Kathy is going through. As often as the multiple events pertaining to this particular tornado cross my mind, I can't imagine how much of it stays with her. I bought this book at B&N because I thought the cover art was cool and I remembered Tim Samaras as that guy from Storm Chasers. I wasn’t exactly sure how likely I was to read the book though. Once I picked it up to actually read through, it was hard to put down. Tim’s story deserved the skilled and thoughtful story telling of Brantley Hargrove. Not only is the story told well, but the Hargrove is able to break the science of tornadoes down into an easy to digest form. I really cannot recommen I bought this book at B&N because I thought the cover art was cool and I remembered Tim Samaras as that guy from Storm Chasers. I wasn’t exactly sure how likely I was to read the book though. I read this book because my husband read it, loved it and recommended I read it, too. It was a tad bit too technical for me but I sure learned a lot about storm chasers and tornados. And from now on I will ALWAYS heed the tornado siren! Fascinating but a lot of the details were way over my head. I knew of Tim Samaras thru watching Storm Chasers. I will also admit to having battled storm anxiety ever since 3 tons of maple tree fell on our house in 2007 (August 23 - won't ever forget that day). That wasn't even a tornado. I really admire the guys who have put (and given) their lives at risk studying severe weather. I was so engrossed with the minute by minute relating of Tim's losing battle with the El Reno twister, that I sat looking at Google satellite with book in lap following the road I knew of Tim Samaras thru watching Storm Chasers. I will also admit to having battled storm anxiety ever since 3 tons of maple tree fell on our house in 2007 (August 23 - won't ever forget that day). That wasn't even a tornado. I really admire the guys who have put (and given) their lives at risk studying severe weather. It's relatively easy to write exciting prose about the adrenaline-fueled chase of a tornado. It's something else to keep a reader spellbound with tales of attempts to fund tornado research. 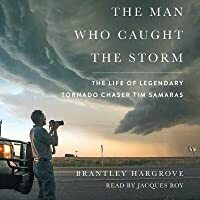 Brantley Hargrove has done both in this excellent book about storm chaser Tim Samaras's life. It really is a well-written book with patience for the details, understanding of the science of twisters, excitement of the pursuit and heart of the man. Anyone who follows weather remembers that El Reno, Okla., torna It's relatively easy to write exciting prose about the adrenaline-fueled chase of a tornado. It's something else to keep a reader spellbound with tales of attempts to fund tornado research. Brantley Hargrove has done both in this excellent book about storm chaser Tim Samaras's life. It really is a well-written book with patience for the details, understanding of the science of twisters, excitement of the pursuit and heart of the man. Anyone who follows weather remembers that El Reno, Okla., tornado and the vague report at first that someone was trapped by the twister when it shifted. We all recall Mike Bettes' video of his team's car flipping over and over as well. But as officials eventually confirmed it was Samaras in the fatal accident, our hearts broke. He was the epitome of the chase - risking his life to further study tornadoes and their makings to save other lives. Hargrove is extremely detailed in his account of the final chase. His research is excellent and he cites all of his findings and you know it's true. Samaras was the Ahab of storm chasing and Hargrove's writing shows that obsession and that drive he had. And, to compare this with another form of literature (joke), I now see comparisons to the campy movie "Twister," which appears to have been based a lot on Samaras' life, to the point of attempting to release Totos in the storms' paths, the battle with the corporate-sponsored goon storm chasers and his independent-minded ways ala Bill Paxton's character of the film. Emotional and incredibly well written. This book will stay with me for years to come. I thought the 2nd half of the book was stronger than the first half. I wish the writer had not written in the present tense. Storm Chasers are some of my favorite people. Living in Oklahoma City area we see the cars and trucks with all of the equipment on the roof every day. I live with one and I remember the day that Tim died. We were worried sick as our family home is in El Reno/Union City took shelter and there was nothing we could do but wait. Over the scanners we heard they had found Tim's car and at first we thought he was the only one killed, but no. Tornadoes are one of Mother Nature's most mysterious creations Storm Chasers are some of my favorite people. Living in Oklahoma City area we see the cars and trucks with all of the equipment on the roof every day. I live with one and I remember the day that Tim died. Tornadoes are one of Mother Nature's most mysterious creations. The power, the unpredictability, there seems to be no pattern to them at all. Why they demolish the town of Moore almost every few years and then there will be one untouched home in the middle. It isn't logical and yet we are mesmerized by them. We want to know how they work. Great strides have been made in early warning systems, but it's still not enough. This was a hard book to read and yet it was a beautiful testament to a man who lived life on his own terms. We will forever miss them all. As with many in depth biographies, this one begins in the subject’s childhood. The Man Who Caught the Storm is an incredible free-fall into not only the life of Tim Samaras but also into the objects that consumed his mind, tornados. Tim wanted to know the what, why, where, and how of these storms that are hard to pin down yet only elusive until they destroy lives and property. Tim is revealed as a genius self-taught engineer and physicist who held no advanced college degrees yet held his own amon As with many in depth biographies, this one begins in the subject’s childhood. The Man Who Caught the Storm is an incredible free-fall into not only the life of Tim Samaras but also into the objects that consumed his mind, tornados. Tim wanted to know the what, why, where, and how of these storms that are hard to pin down yet only elusive until they destroy lives and property. Tim is revealed as a genius self-taught engineer and physicist who held no advanced college degrees yet held his own among those experts who did. Initially Tim was a watcher, not a chaser. He invented tools and encouraged others with similar interests to assist him on his excursions across Tornado Alley during “tornado seasons”. Over the years his caravans became more and more sophisticated as he found that he needed another bit of information to solve the puzzle of why some thunderstorms spawn tornados, and why some of them are deadly while others don’t even reach the ground. Brantley Hargrove’s narrative is compelling and tells the story of specific tornados, known now by the cities and towns they hit or destroyed. Funding was always an issue and Tim was able to join forces with well-known weather entities, such as National Geographic, The Weather Channel, The Discovery Channel, and other storm chasers who had their own fleets of vehicles and collection of unique, complex tools. There was some competition but there was also a brotherhood. The constant search for funding was ever present. A caravan of high-end vehicles and high-tech instruments is extremely costly to purchase and maintain. As the urge to learn more about tornados requires a closer and closer look inside the tornado itself, the risks became greater and greater. Although for many years no storm chasers were killed in pursuit of knowledge, as Tim himself said, “Somebody’s gonna get bit.” When that happens, the event is taken apart second by second, minute by minute, and the tornado itself is dissected into its component pieces even as they constantly change to try to find out why it happened. You may need tissues to read this part because it gets very emotional. We meet not only Tim’s coworkers on his “real life” job, but also his fellow tornado researchers, and we get an intimate look at his family, who supported him even when they knew what he was doing was so very dangerous. The author of his biography has done extensive research into the science surrounding Tim’s work as well as into what drove Tim to do what he did. One thing Brantley Hargrove did not allow himself to do is personify the tornados and storms. They are what they are – phenomena of nature, not thinking, plotting creatures. This is what makes this book the outstanding account that it is. People made decisions, good or bad, and storms were the result of nature, wind, heat, rain, and everything that caused them to combine on that particular day at that particular time. What a wonderful book! So, this is the part where I confess that I have a weird, honestly morbid, obsession with the 2013 El Reno tornado. I'm not even a meteorologist or a storm chasers aficionado, it's just El Reno. It was a monster, in every senses of the word, an anomaly which thankfully stopped before it reached Oklahoma City and the gridlock of people trying to run away. Chilling. Good news is, the journalist who wrote The Man Who Caught The Storm developed the same obsession for almost the same reasons I did, the need to understand how and why Tim Samaras, his son Paul and his colleague Carl Young died that day. I could probably write a lot about Tim Samaras and all the little (and big) things that made me realize how good he was as a scientist and a human being, but this book made me very emotional, as the loss of wonderful people often does, so I'm going to keep this short. However I need to say this: Brantley Hargrove did an amazing work with this biography. If I remember well he worked on it for more than three years, did an incredible amount of research and interviews for this book to be as accurate as possible. Nothing is fictionalized (view spoiler)[(Hargrove had access to Carl Young's recordings of El Reno until it stopped and to Dan Robinson's rear dash cam, it was a bit overwhelming) (hide spoiler)] or dramatized, Hargrove is very respectful and as close to reality as possible. I really appreciated that. If you're worried about the scientific aspect, even though I am not a meteorology expert, I had no problem understanding this book with my sparse knowledge of tornadoes and tornado terminology, and everything is explained clearly, making it a very accessible book. Science and meteorology owe Tim Samaras so much, and as always when great scientists die, I can't help but wonder: is the new Tim Samaras already born?